Shred Some Gnar in Caras Park! Don’t get us wrong – we LOVE fall in Montana. and pressing those amazing Bitterroot Macs into delicious cider, we get a little antsy for the main show. Fall, you’ve been a great opening act – but it’s time to bring on the winter! If you, too, are looking to jump right in you’ll want to check out this weekend’s 6th annual Treasure State Shred Fest. There’s a lot of angles to this fundraising event, but let’s cut straight to the chase: There will be a mad rail skiing and snowboarding competition on REAL SNOW right smack in the heart of downtown Missoula. For the last month, organizers have been collecting snow and ice chippings from Glacier Ice Rink and coddling them in blankets, explained Shannon Parry, event director. Once the hill has been sufficiently snow-packed and the rails are set, 25 skiers and 25 snowboarders will compete for prizes – and you get to watch for free! 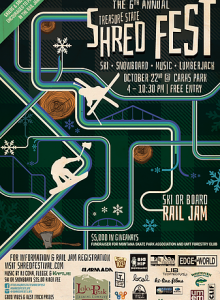 Shred Fest 2016 is a fundraiser for the Montana Skatepark Association, which helps build skate parks across the state, and the University of Montana Forestry Club. A portion of beer sales will go towards those organizations, as will money raised through multiple raffles. The Forestry folks will send over some lumberjacks for a pretty amazing display of “timber sports”, and the whole day will open up at 2 pm with a pro sale from vendors across the region. And by the way, the raffle prizes are pretty sweet: Snowboards, skis, lift tickets and a ski-and-stay package at Whitefish Mountain Resort. For more information about Shred Fest 2016, check out their Facebook event page. 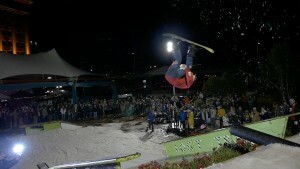 Sign up for the rail competition at shredfestival.com.